There is nothing better than starting your day by having a whole-grain breakfast in these STRAWBERRY BUTTERFLY, cereal bowls filled in this Handcrafted Boleslawiec Pottery 5.5" dish from Pottery Avenue. Featuring a curved profile and a medium size, this Polish Stoneware exhibits a durable stoneware that makes it tough enough to withstand varied temperatures so that it can be used for baking and refrigerating. There is nothing better than starting your day by having a whole-grain breakfast with cereal bowls filled in this Handcrafted Boleslawiec Pottery 5.5" dish from Pottery Avenue. Featuring a curved profile and a medium size, this Polish Stoneware exhibits a durable stoneware that makes it tough enough to withstand varied temperatures so that it can be used for baking and refrigerating. The non-toxic paints make it food-safe, while the stylized design from the classic collection STRAWBERRY BUTTERFLY give us a dish to make each meal a celebration. The bold yet delicate flower pattern is complemented by a green, black, and blue floral motif wreath around the bottom of the piece, and a full bouquet in the center of the bowl. When you're and see the floral design it just makes you smile. 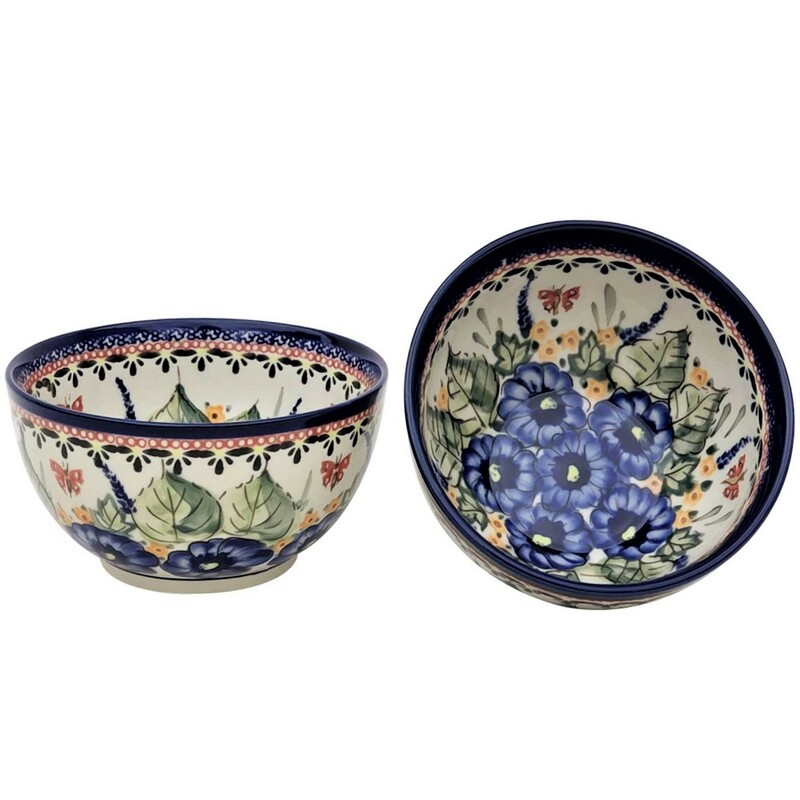 Painted with centuries old hand stamp technique, this Polish Pottery STRAWBERRY BUTTERFLY pattern by Zaklady Ceramiczne “BOLESLAWIECE” skilled artisans is sure to captivate you with its remarkable artistic appearance. The design is applied using sponges from the Baltic sea where each motif is skillfully cut into the sponge for hand stamp application. This bowl will last a life time due to the clay indigenous to the region. It has been fired at over 2000 degrees making it a stoneware and extra durable. Polish Stoneware Strawberry Butterfly pattern is a great piece of art that has been crafted by master artisans from Zaklady Ceramiczne “Boleslawiec” to render this Polish stoneware a uniqueness of its own. The attractive depiction of blue-hued flowers in a scenic garden background where green bushes and cheerful butterflies surround them from all sides help to create a wonderful display. This handcrafted Unikat stoneware can be put to varied uses without worrying about maintenance. The cobalt-blue rims are neatly complemented with a classic pattern, including multiple panels and a scalloped design to enhance the overall beauty of this Polish art pottery. A national treasure, Boleslawiec ceramics have been manufactured for centuries. Developed from natural ceramic clay that can be found near Boleslawiec at the Bobr and Kwisa rivers. According to historical sources, the first stoneware was made in medieval times and in the early 16th century, local potters formed guilds to ensure perfection. Zaklady Ceramiczne "BOLESLAWIEC" was founded by one of the original men with the first pattern dating back to 1759. “STRAWBERRY BUTTERFLY 2-CUP BOWL“ is a UNIKAT pattern based of the 300 year old pattern "EYE OF THE PEACOCK". Designed by top designers and imported by Pottery Avenue, the premier importer of Polish Pottery & Polish Stoneware.